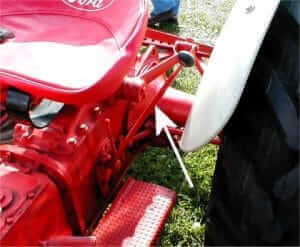 Note the extra long lever coming out of the left side pto shifter cover on this 8N. This is the extremely rare Sherman live pto conversion for the 8N. The lever operates a manual clutch pack between the transmission and the rear end pinion gear. This allowed the tractor operator to start up normally with the pto engaged and then use the long lever to disengage the tractor drive and stop the tractor without stopping the pto. If you use the lever for stopping and starting and left the regular foot clutch alone you had a “live” pto.